On 23 April 2018 the Amadiba Crisis Committee, represented by their lawyers Richard Spoor Inc. and the Legal Resources Centre, is taking the Department of Mineral Resources (DMR) to court over attempts to mine their land in Xolobeni on the Wild Coast in the Eastern Cape. The applicants will request the court to rule that the DMR cannot issue a mining license without the community’s consent. If successful this case will set a precedent for other communities affected and threatened by mining in South Africa and across the African continent. Mining in the Xolobeni community would necessitate the removal of about 70 households from a farming community that is agriculturally active and food secure. It would disrupt the social fabric of the community and be a traumatic disruption of residents’ connection to the land and to their ancestors. On an environmental level, the mining would devastate water supply, air quality, grassland, marine and estuarine ecosystems. Opportunities for growing ecotourism and agriculture would be destroyed. 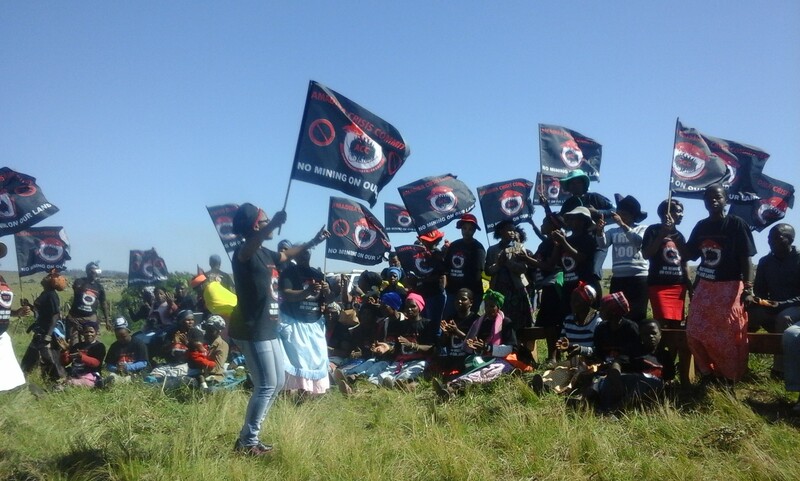 Objections to mining from the Xolobeni community have fallen on deaf government ears and members of the community are now heading to the Pretoria High Court to seek a declaratory order that will prevent any mining from occurring in Xolobeni. This court case is part of a larger “Right to say NO” campaign being organized by mining-affected communities across Southern Africa. The “Right to Say NO” is a campaign organized by communities who seek to be at the forefront of the decision-making process that determines the type of development that can take place on their land. It is a campaign based on the internationally accepted right of FPIC (free, prior, and informed consent) for communities threatened by proposed projects on their land – a right recognized in the United Nations Declaration on the Rights of Indigenous Peoples (UNDRIP). The court case of the Amadiba Crisis Committee is part of a growing global movement of communities who are resisting the extractive activities of transnational corporations (TNCs). Do not ruin one of the most beautiful heritages on planet earth with highways and mining. Fix existing roads in the Transkei and let Capitalist Greed go and ruin some other part of the planet. This is indisputably their land. Mining companies should leave it alone!